There has been a fair amount of news about recycling in automotive-related industries. Most of it has been about the demise of Redisa, the tyre recycling agency. But what about waste oil? Those who generate more than 20kg of hazardous waste a day are required to register on the National Waste Information System and to report on the volumes generated and taken away for recycling. Those who fail to comply with the regulations set out by legislation face penalties such as fines or even jail time. It is the legal obligation of businesses that generate waste such as used oil to ensure it is responsibly collected and taken away to a registered facility for processing and recycling, says the Recycling Oil Saves the Environment (Rose) Foundation. Used oil is a hazardous substance – one litre can contaminate a million litres of water – and so generators also face a moral responsibility to ensure their used oil does not end up in the environment. With nearly 11-million vehicles on the road in SA and more than 3,000 registered workshops, plus unregistered and backyard mechanics, a huge volume of used oil is generated in the automotive sector. Bubele Nyiba, CEO of the foundation, says major workshops are compliant with the requirement of the Waste Act, but a problem exists in the pricing structure for used oil. Best practice in other developed countries has used-oil generators paying collectors to take away waste. “The Rose Foundation is urging automotive workshops and used-oil generators in general to consider their role in the responsible collection of used oil and to reconsider the price they are demanding per litre. “Our concern is that pricing used oil to the point it becomes a commodity will make it unsustainable for most used-oil collectors to continue to operate. The fewer used-oil collectors, the less oil collected – meaning a much larger volume is left to possibly make its way into our environment through irresponsible disposal. “The Rose Foundation has set increased used-oil collections as a priority in SA and we do not want to see the current volumes dwindling due to unsustainable business models driving out industry players,” says Nyiba. He urges used-oil generators to use a registered used-oil collector. This will ensure that collection, transportation, storage and re-refining of used oil is managed in a sustainable, ethical and responsible manner that is compliant with legislation. The foundation says its collectors can also safely remove related wastes such as used oil filters, oily rags and oil-soaked sawdust for responsible disposal and/or recycling. “In addition, we would like to see workshops becoming the place where the public can drop off their small volumes of oil from self-servicing of vehicles. 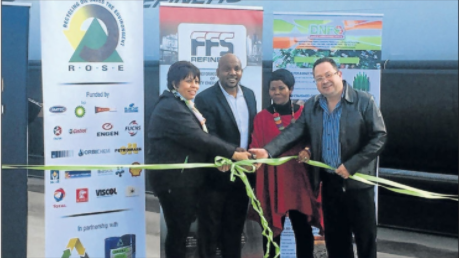 “There is a workshop in every town in SA and this means that we would not need to invest in additional facilities for the public to drop off their used motor oil. The workshops should be ambassadors of usedoil collection,” says Nyiba.